This black and white card has been tinted by hand. 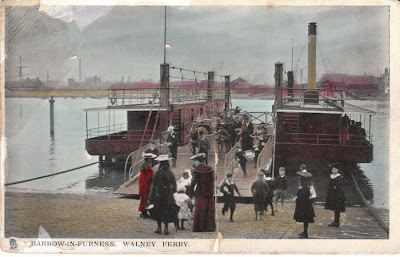 Walney Island has been connected by a bridge (Jubilee Bridge) to the Mainland since 1908 - that is one year after this card was sent in 1907. The card describes the island as agricultural "possessing a very rich soil which produces good crops of grain... part of the island has been acquired by the Barrow Corporation and made into a recreation park for the inhabitants..."
Barrow is an area of ship building. My father in law worked at the ship-yard, and my brother in law still works there - mostly on submarines. Ferries seem to have a pedestrian elegance.